If you read my last post, you know that I believe in the “cook once, eat twice” philosophy. When I make a dish that requires a little bit of time in the kitchen, I will usually double the recipe and transform the leIftovers into an entirely different meal on another day. It’s a real timesaver and I also find it to be a fun challenge. My Tandoori Chicken Kabobs are a perfect example of this. After my last post I had some extra chicken, so I decided to use the leftovers to make one of my favorite dishes- Tandoori Chicken Pizza. I’m really excited to post this recipe because it’s definitely a crowd-pleaser. I love taking international flavors and incorporating them into classic American dishes. This dish has a nice mix of sweet and savory flavors and who doesn’t love pizza? I like to make my own pizza dough when I have the time but for this recipe, I took a shortcut and used a ball of pizza dough that I bought from my local pizzeria. Most pizzerias will gladly sell you some of their dough but if you’d like, you can also use refrigerated or frozen pizza dough from the grocery store. 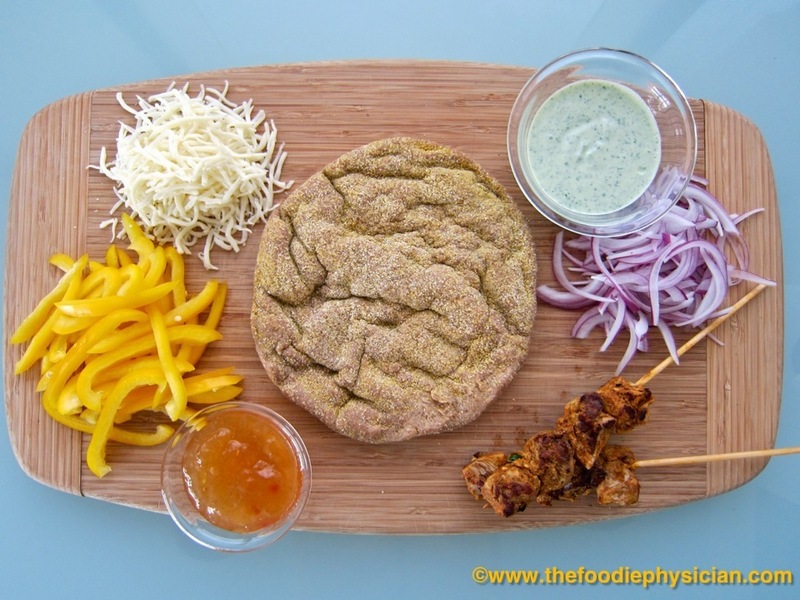 To make the recipe more nutritious and incorporate some whole grains, I used whole-wheat pizza dough. Whole grains have high amounts of fiber, vitamins, minerals and antioxidants and it is recommended in the USDA Dietary Guidelines that at least half of the grains we consume should be whole grains. 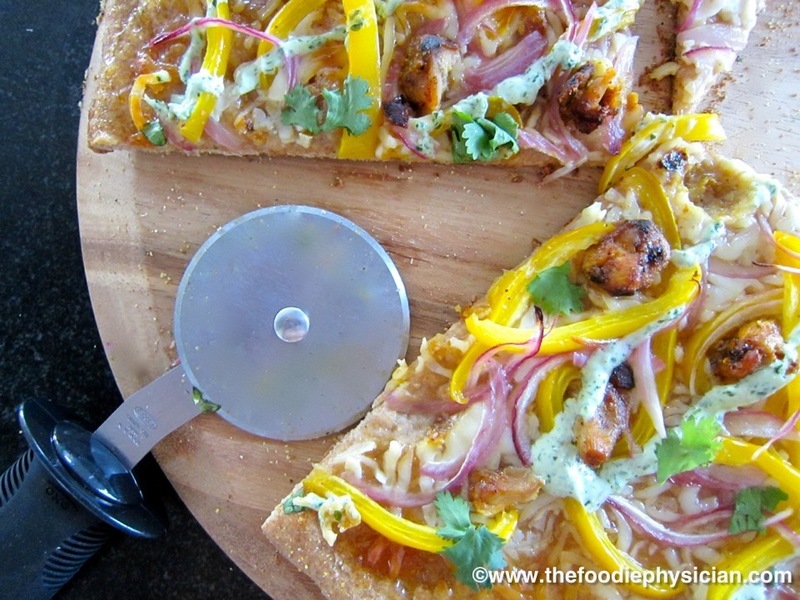 Instead of tomato sauce, I spread sweet mango chutney on the dough and sprinkle on pieces of spicy Tandoori chicken. 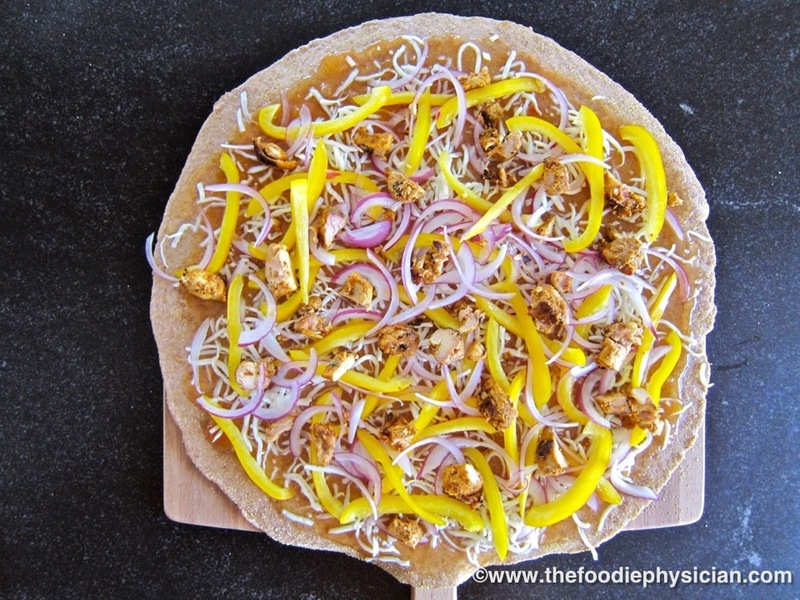 To add color and texture, I also top the pizza with reduced-fat mozzarella cheese and slices of yellow bell pepper and red onion. And for a final burst of flavor, I like to serve the dish with a homemade cilantro yogurt sauce that I drizzle on the hot pizza when it comes out of the oven. I like the way the cooling, tangy yogurt sauce balances out the sweetness of the mango chutney and spiciness of the chicken. To achieve the perfect crust with a crispy exterior and doughy interior, you need a really hot oven. Restaurants use wood-burning ovens that reach extremely high temperatures, something home ovens are not designed to do. The best way to achieve restaurant quality pizza in your own kitchen is to invest in a pizza stone. A pizza stone is a heavy stone made of clay or ceramic that holds heat exceptionally well and evenly distributes it, thus mimicking the effects of a commercial pizza oven. Because it is made of porous material, it also serves to pull moisture from the surface of the dough producing a perfectly crispy crust. To get the maximal benefit from the pizza stone, place it on the lowest rack in a cold oven and preheat it for at least 30 minutes before using it. Another great tool for making perfect pizza at home is a pizza peel. A pizza peel is a wide, flat wooden paddle used to transfer the pizza in and out of the oven. Its front edge is tapered so that it can easily slip under the pizza. It is important to use a generous dusting of cornmeal (can also use semolina or breadcrumbs) on the peel before transferring the dough onto it. The grains act as ball bearings and allow the pizza to slide easily on and off the peel. Without it, the pizza will stick to it and you won’t be able to easily transfer it into the oven. If you haven’t used a peel before, you may want to try it out with smaller pizzas first since they are easier to maneuver. You can cut the dough for this recipe in half and make two separate pizzas. If you don’t have a pizza stone, you can always bake the pizza on a regular baking sheet but keep in mind that the crust won’t get as crispy. Place a pizza stone on the lowest rack of the oven and preheat oven to 500 degrees for at least 30 minutes. Roll the pizza dough out to a 15-inch circle. Sprinkle the cornmeal on a pizza peel and transfer the dough onto the peel. Alternatively, if you don’t have a pizza peel, you can use a baking sheet. Spread the mango chutney evenly over the dough leaving a ½-inch border. Sprinkle mozzarella cheese and chopped chicken over the chutney. Toss the pepper and onion slices with the oil and sprinkle them evenly over the pizza. Transfer the pizza onto the preheated pizza stone. Bake 10-15 minutes until the crust is golden and cheese is melted. While the pizza is baking, prepare the cilantro yogurt sauce. Place the yogurt, cilantro, ginger, lemon juice and salt in a mini food processor or blender and puree until smooth. When the pizza is done, remove it from the oven and drizzle cilantro yogurt sauce on top. Garnish with cilantro leaves. Devour! What are your favorite pizza toppings? Leave a comment and let me know! I love pizza, I love chicken… what more to ask?? Phenomenal!!! Love every last bit of it! Thanks for your comment, Ann! 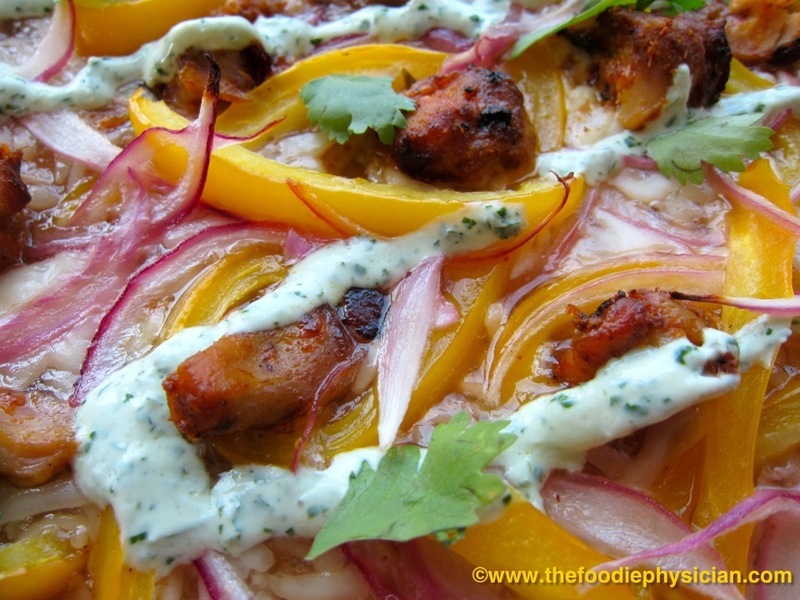 Great use of tandoori chicken leftover. The pizza looks super! Sonali that looks AMAZING! I love cilantro, I use it as much as I can when I am cooking. What a delightful flavour for pizza. Also good to know about the pizza stone, must consider getting one for my terrible oven! Thanks Peggy, it's great to hear from you! I love my pizza stone- it makes such a difference, perfect crust every time! Hey! I just found you through Cupcakes and Kale chips. Glad I did because this is SO my kind of recipe. Thanks for stopping by, Julie! Isn't Cupcakes and Kale Chips wonderful! I'll be heading your way soon and I'll definitely drop a dish off at the blog hop. This is a really awesome food blog! Really looking forward to exploring and being inspired by your recipes! 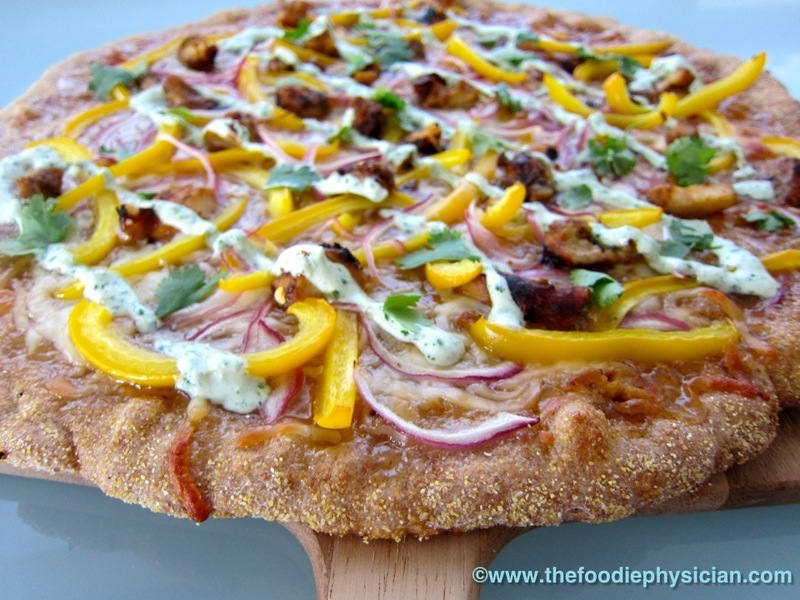 I love the flavors in this healthy pizza!! It's as beautiful as it is delicious! Thank you for sharing on Fit and Fabulous Fridays, Sonali! For those who love eating chicken, this pizza variety is definitely a must-try! You do not even have to conscious about your fat intake because it is only minimal. This shows that those who are trying to watch their weight can still indulge in their favorite meals, thanks! I'm making this tomorrow. Going to use left over aioli sauce that I made a couple days ago and just add some ginger. Talk about flavors! Mango chutney, onion, garlic, ginger! Wow! 4th of July Fireworks in my mouth! I never knew what the pizza stone was for. Interesting! Yum, that sounds great! You're such a little foodie with your leftover aioli! 🙂 I love my pizza stone- you get a perfect crust every time. Hope you're doing well! I adapted this to what I had in my kitchen and what I could make using 20 minutes of prep time. Instead of tandoori I used rotisserie chicken from Whole Paycheck, and instead of making pizza dough I bought a multi-grain pre-made round of dough. I should have cut the chicken into smaller chunks. I can see how the tandoori flavor would be GREAT with this. Since I used my aioli sauce for the burgers I ended up following your recipe and making the sauce. I added mint and fresh basil from the garden plus tobasco which was really good. Minh thought I was quite the fancy chef! I'm sure freshly made pizza dough and tandoori chicken would take this up a couple notches but I thought it was great! So glad you liked the recipe! I think it's great that you can adapt a recipe to the ingredients you have at home. I really like fava beans. I make a spring risotto and toss in fava beans, asparagus and peas. You can also just sauté the favas in olive oil with some lemon and garlic (+/- pancetta). If you want to get fancy, try tossing them with some caramelized onions. Yum!